We just kicked off our fall fundraiser – Mixed Bag Designs – on Wednesday, September 3rd. 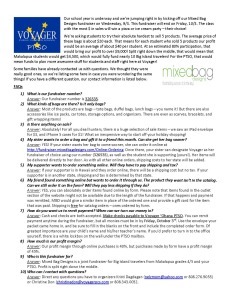 By now you should have received a packet in your child’s backpack that includes an order form, catalog, prize list, and other useful information. Mixed Bag Designs is a joint fundraiser supporting Big Island travelers from Makalapua grades 4/5 and your PTSO. We are asking students to try their very best to sell five (yep, just 5!) Mixed Bag Designs products. Is your supporter off-island? No problem! You can provide the website (http://fundraiser.mixedbagdesigns.com/Online-Ordering) and our seller number (326535) and they can have their items delivered directly to their home or office! The highest selling class will get a pizza or ice cream party – their choice! Questions? Click on the list of questions below! And our sincerest thanks for your continued support!